Both the driver’s and passenger’s front seats are equipped with a seat belt warning light. The warning light, located on the instrument panel, will show the status of the driver and passenger seat belt. NOTE: The driver’s and front passenger’s seat belt warning light will not light up if the front passenger seat is not occupied. For additional information, refer to “Warning lights, indicator lights and audible reminders” in the “Instruments and controls” section of this manual. NISSAN recommends that pregnant women use seat belts. 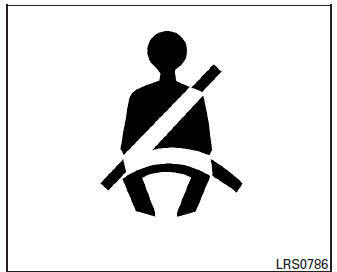 The seat belt should be worn snug and always position the lap belt as low as possible around the hips, not the waist. Place the shoulder belt over your shoulder and across your chest. Never run the lap/shoulder belt over your abdominal area. Contact your doctor for specific recommendations. NISSAN recommends that injured persons use seat belts. Check with your doctor for specific recommendations.